For years prior to 1961, parents used cloth diapers on their children because there was no other option. Since the 60’s, paper diapers have grown with such popularity that many moms now choose them because they, too, think there is no other option. Ten years ago I began my own personal search for a cloth diapering alternative in our modern world. I hit so many brick walls that I began to wonder if the reason was perhaps because there was something wrong with cloth diapering. Were these diapers unsanitary? Maybe all the extra laundry was too much work. Could it be that moms had finally grown weary of diaper dunking? It didn’t take me long to decide that diapering babies using cloth must now be an archaic, extinct notion. The days of plastic pants and safety pins had been replaced with the quality and functionality of disposables. We, as a nation, had obviously arrived in diaper utopia. However, I couldn’t help but wonder…what cost would we now pay for such luxury? It quickly became apparent to me after a few trips to the grocery store. Upon bringing my Tigger & Pooh stamped paper diapers home, I realized exactly the price to be paid – too much! Just as that package of diapers was walking through my front door, I found myself exchanging it for a garbage bag full of its soiled predecessors. Essentially, I was throwing away my money. How much was I actually wasting? You might be surprised to learn – cloth vs. disposable diapers: a good estimate. Twenty-two years ago it was estimated that over the course of a single year, 18 billion paper diapers were sold and used in the United States alone.1 For a family with a child in diapers, the diapering portion makes up approximately 50% of their entire household trash content.1 What a waste! And that waste is willing to stick around for a while, too. It has been predicted that it could take 250 to 500 years for a single disposable diaper to decompose.2 That’s not the legacy I want to leave for my great, great, great grandchildren – ick! 1. Research your cloth options. The hardest part can be getting started. Visit forums where moms flock to talk about cloth. I love the Diaper Jungle and Stephanie’s cloth diapering section in her forum! 4. 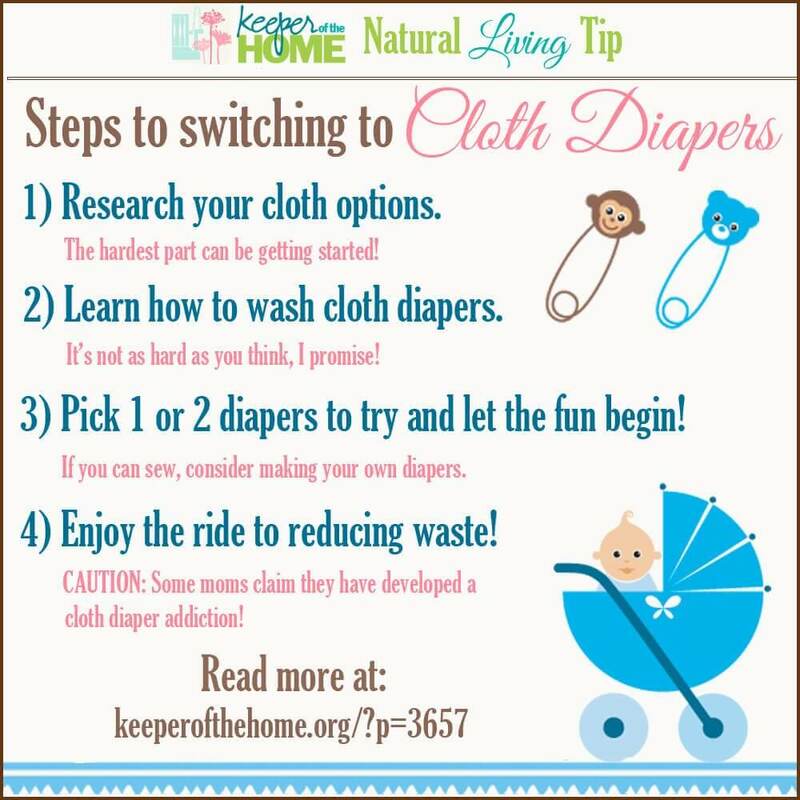 Enjoy the ride to reducing waste by using cloth diapers regularly. For those who cloth diaper, what was it that brought you to that decision? For those who don’t, what holds you back? 1Lehrburger, Carl. 1988. Diapers in the Waste Stream: A review of waste management and public policy issues. 1988. Sheffield, MA: self-published. 2Link, Ann. Disposable nappies: a case study in waste prevention. April 2003. Women’s Environmental Network. Timely article for me! I have a 16 month old and I have been researching to switch to cloth. Now we are expecting another. I have done a lot of reading. I am just nervous about the initial investment b/c we really don’t have any wiggle room in our budget- and I don’t want to get the wrong thing! I am looking forward to the Great Switch, though! .-= Michelle´s last blog ..I Love Lists =-. As a new mom, I found the idea of using cloth diapers overwelming and gross but as the second one came around I realized that poop is poop and really was no big deal. I waited till I was a bit more rested and she was about 2 weeks and then took the leap!!! I know this will sound crazy but every time I did a load of diapers and sat folding them to put in our pretty diaper basket, I felt good about what I was doing and felt as tho I was making a wonderful change in the world around me. At least three of my friends switched to cloth diapers after seeing the ease with which we did it! My little one prefered the cloth and as she got older loved picking out the prints she wanted to wear. There are so many resources out there and so many SAHM moms that make them for a side business. When all was said and done, I was only out about $40 by the age of 2 1/2 because I was able to sell off our used diapers each time I needed to get the next size…you can’t say that about the paper ones! .-= Hallie´s last blog ..A Hero worthy of the name =-. When I was pregnant with my daughter and thinking about cloth vs. disposable, cloth felt like a big commitment and something I had to honestly tell myself I wasn’t committed to. I knew it was good for the environment and had benefits to my daughter, but I was trying to be realistic with my lack of motivation. When my daughter was about 4 months old, two friends from church who were cloth diapering offered a few of their diapers for me to try out. I wasn’t even all that excited to try, but figured I would take the opportunity. To my surprise, I really enjoyed throwing the cloth diapers in the diaper pail to be washed and not in the trash can. There was a feeling of satisfaction and the thought that I was doing something good for the earth and for my daughter. We have been using cloth ever since (my daughter is now 16 months old). As a side note, I am not the best housekeeper. My consistent cleaning skills need some work. HOWEVER, I have not found washing diapers to be a problem. I find such satisfaction in limiting trash, money, toxins, etc. that I think it motivates me to keep up with the wash. So coming from a girl who has trouble keeping up with other chores, this one has not been a struggle for me. I have a 26 month old and a 6 month old, and they’re both in cloth diapers. The initials reasons were financial savings & environmental issues. I’m pretty partial to Bum Genius diapers, but we’ve simplified and started using more of their Flip diapers – for cost savings & because the aplix (velcro) was wearing down on our regular Bum Genius. Now I save the velcro diapers for daddy, and I use the snap ones. .-= Dawn´s last blog ..Tot School – 26 Months =-. Did you know that you can call Bum Genius/Cotton Babies and they will send you new velcro tabs for free? We have used our BG for 2+ years and were ready to start them with our newborn also, so I brought the diapers and tabs to our local seamstress (since I have no clue how to sew) and paid $4/diaper to have the new tabs put on. They are good as new now! .-= Laura L´s last blog ..14 March =-. My boys have been out of diapers for a long time now, but when my oldest was about 6 months (he’s almost 12 now), he developed the worst rash on his bum. I had been reading about these ” crazy” women who were cloth diapering and not having any diaper rash problems. I took the plunge, bought some used ones on ebay and I never looked back! When my youngest came along a few months later, he was 100% cloth diapered all the time. Both of my boys potty trained by 2 (even at night) and I totally credit the cloth diapers. .-= Paula´s last blog ..75/365 Bullfrog Closeup =-. My husband was concerned about sanitation and was not on board with dealing with poopy diapers. I was too tired and lazy to consider an alternative way of diapering. I knew lots of people who used cloth diapers, and knew that it would be cheaper, but just couldn’t bestir myself. I have to pick my battles on how to run the household and chose not to fight this one. So we used paper diapers. .-= Sarah S. Chicken´s last blog ..Procrastination =-. For us disposable was not a option. Let me explain when I was a baby (31 years ago ) my mother try disposable on my to find out very quicly that I was allergic to some of the material in that product, so she made me some cloth diaper and later in my teen some cloth pads. So when I give birth at the hospital with my first (we were planning to use cloth after we go home) we notice a severe reaction, Poor little girl was bless with my super sensitive skin!!! So cloth we went, and by the time our second child came we were ready and put cloth right after birth! Maybe I haven’t done anything else then cloth so I would not no any better but I was visiting a friends house and help her out to put a garbage full of disposable outside for her the smell made me almost loose my lunch!!!! then I realize, how gross disposable were!!! I preferred washing my diapers if that makes any sense!!! .-= Renee´s last blog ..Just in time =-. I also sew our own diapers now. I wish I had known when we started that it is possible. I love sewing but just had no clue at the time that there are patterns out there and stores where you can get your own special diaper fabrics. It is WAY cheeper then buying them premade! I had wanted to use some of the newer styles of CDs but the cost was prohibitive so we stuck with mainly prefolds and covers… Now that I am sewing our diapers we also have fitteds and I am just starting to experiment with one-size pocket diapers! Fun stuff! Pretty soon here we will have 3 in diapers…The oldest is only in diapers at night though so that is nice. He self trained!!! I think I always had it in my mind that cloth diapers were the way to go (my mom used cloth, so I think that helped), and when I first Googled cloth diapers when I was newly pregnant, I was amazed by all of the modern options available. We made a decision immediately to use cloth; both of our kids have been cloth diapered since birth, and #3 (due in July) will be too! We’ve had to do our fair share of troubleshooting (washing in communal washing machines, cloth diapering on vacation and in the church nursery, cloth diapering two kids at once, etc.) but we love it and have never regretted our decision! We use a little of (almost) everything–prefolds, flats, fitteds, and pockets! I especially love Flips! We also love cloth wipes! We used paper on the first, then thought again and used cloth for the 2nd and 3rd… Besides costing less, one of the benefits is that they were more aware of their body functions–they could feel the wetness vs. it being wicked away immediately, which helped learn to use the toilet. Also, our daughter had very sensitive skin, and cloth was better for her skin. When I felt too overwhelmed to wash diapers, we used a diaper service, which cost a tiny bit less than disposables, but delivered a fresh bag every week of the sweetest smelling diapers. Their washing process is set up to be very efficient, so that was another plus. I bought a couple kinds of cloth diapers, but liked the sort of pre-sewn ones the best, to just lap each side over through the crotch. Super easy. We’ve always used cloth. I’ve used Seventh Generation disposables for two different times- for the first 4 days of my first child’s life (I was told it would be too “hard” to use cloth then, and I believed it, since then, I diapered my second child from the first diaper in cloth since I wanted to). I also used disposables (again 7th Gen) for one time during a vacation where there was no laundry access, but only the first half of the week, until I could switch and wash when I got home. That just shows you how much I love the cloth! I can’t stand how I can’t tell if the other kind is wet, and also how the poop seems to leak so easily out of disposables. I don’t even like the way it feels on the baby’s bum, or the way it looks. I just LOVE cloth diapers. I was cloth diapered, and my MIL used all cloth with her kids too, so for us it was just the way to do it. I never considered anything else. It just seemed like the cheapest (if you don’t just buy things for an “addiction”) and the most responsible way to be a good steward, in my opinion. Its not gross for me, and modern cloth diapering has done away with pins, plastic pants that didn’t breathe, wet pails and the like. Its easy now! The only issue was that 4 years ago when my first was born I didn’t know anything about how to get hold of cloth diapers, so I just went with the first thing suggested. Thankfully it turns out to be a great choice and we’ve loved it (prefolds with snappis and Super whisper wrap Bummis covers). I diapered my first to training at 31 months and now into over a year of diapering #2 with those diapers. Hopefully more to come! We started cloths with our 3rd when he was about 3mths old (last June). We switched because we became a one income family that needed to cut costs big time. Cutting out the weekly expense of diapers and wipes (I made my own wipees) was something that helped. And it really did make such a difference. Plus, as it turns out, cloth dipes are so EASY! But I did do my research before I bought my first set of cloths. I also made a few dipes myself too. On to using cloth dipees with our 4th one due in September!! If people are hesitant to try cloth, they might want to search around and see if a local diaper store (online or tangible) does a diaper trial. This was what helped me take the plunge. It was 2 weeks and $40. We were able to try about 8 different brands to get a good feel for the market. Afterwards, i convinced two other friends to do the trial and they loved it too! My kids are now 20, 17 and 10, so it’s been a long, long time since I diapered them. We used cloth from the very beginning with all of them. We lived in the country with very rusty water so we chose to use a diaper service along with Nikki diaper covers and cloth wipes. I can still conjure up the aroma of a delivery of fresh diapers all these years later!!! Although none of my friends used cloth, two of my SIL’s did. We even took cloth diapers along with us on vacation. I’ve used a combination of cloth and disposable for all of my six children. 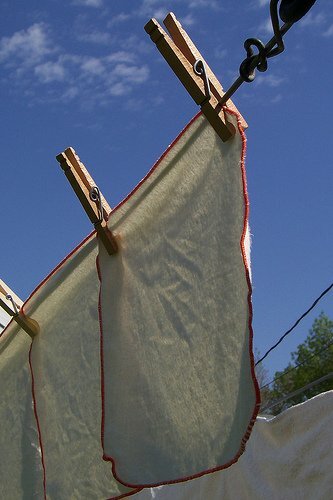 I love using cloth diapers and especially love seeing them hanging on the clothesline and folding them. Anyway, I’ve recently been having a problem with putting cloth on my two year old. Whenever I do – he develops a rash around his leg where the cover over the diaper wraps around his leg. For now I’m just going with disposables and hoping to potty train him in about three months. But I would definitely encourage anyone to at least try cloth diapers. I believe it’s the best and I’m sure much more comfortable for baby. For me, the first reason was how much healthier cloth diapers are for our babies. A friend basically dared me to try it and I’m so glad I did! We transitioned into cloth when our daughter was about 3 months old and have been a huge fan ever since. She’s almost never had a rash and we’ve saved thousands of dollars! We’re in a simple routine and it’s honestly easy and fun. I think cloth diapers are way easier than most moms realize…. otherwise so many more babies would be in cloth! I use cloth most of the time and love it. I am using disposables at night on both my kids, but I would like to switch to cloth at night with the next baby I am expecting. I am just afraid that I would have to get up at night and change diapers. My kids tend to wake up a lot at night anyway. Do cloth diapers last all night? I also use the disposables when I go on a trip and for about a month after my babies are born. My laundry room is in the basement , so I have to wait until I can go up and down stairs to start using my cloth diapers! It seems almost impossible to keep anything from going up the back in disposables on a newborn, but I never have trouble in cloth! I make my own while I am pregnant, because I always have this urge to sew then! I just got a pattern for covers and can’t wait to try to make my own! @Brooke, A hemp liner is a great way to make it through the night. Try a microfiber or cotton doubler (or even large insert) over the hemp – the microfiber absorbs faster than the hemp, but the hemp absorbs MUCH more. Remember that hemp needs prepped, prepped, prepped. I think I had about 20 washes before my hemp was really good. With my oldest son, I didn’t even know people still used cloth diapers. When my second was about 14 months old, I read an article about the waste diapers cause, the chemicals in them, and thought of the money we spend every month on what becomes garbage. 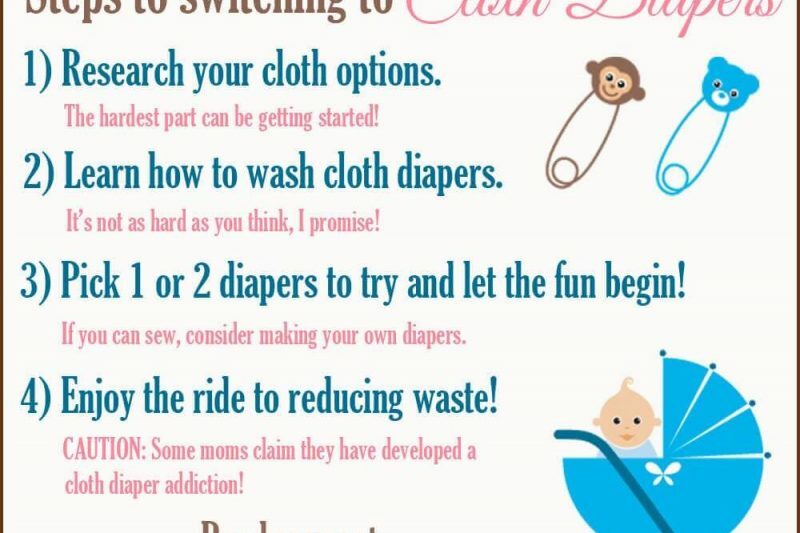 Then I had to tell hubby and worded it ever so carefully – “I don’t think we should use disposables anymore.” Tried to keep the phrase “cloth diapers” out of the conversation if at all possible! I thought we’d put our toe in and see how it went, but we ended up in cloth full time really quickly. With son #3, we used disposables until he was big enough for the cloth. He’s been in cloth almost exclusively since. We had him in ‘sposies overnight once, and he ended up with such a bad rash that we had to take him to a dermatologist. After I switched, I found myself going to more natural options in lots of other things. Cleaning products, composting, recycling more – all kinds of ways. Then, I decided that this cloth diaper thing was here to stay, so I even opened my own online store! Hubby really has come full circle – although, poopy diapers still are pretty gross to him. I love the fun colors and prints you can get! At first I thought “who cares? no one but me sees it anyways!” – now, I totally get it! And I love to see a little cloth diaper peeking out of the top of his pants – much cuter to me than a paper one. When my second child was a baby, we found ourselves 2 days till payday, broke and out of diapers. When I called my mother to see if I could barrow some money to buy diapers and she did me the best favor ever… she showed up to my house with an old flannel sheet and tought me how to make and use cloth diapers. My next 2 babies have been cloth diapered all the way. Before that moment I would have never thought of doing such a thing, the things that rise up out of necessity!! .-= Renee´s last blog ..Wonderful Sunny Day =-. I first started cloth diapering for environmental reasons…it just seemed wrong to me to use so many resources to make and then ship and then dispose of waste. But it was scary at first! I didn’t know anyone who had done it. And people I mentioned it to (looking for information from anyone who might have tried it) were really discouraging about how much work cloth was. Almost 3 years later, I have no idea why. Where we live it’s so much easier to be cloth. I can’t imagine driving 30 miles to the nearest store just because I needed diapers or wipes. I have two little ones in diapers now and it’s really no problem. I have true respect for the women of old who did their laundry by hand though…tossing it in a modern washer is SO easy. And like someone else mentioned, I love my cloth so much it’s hard to give it up for vacations, so yes, I’ve packed an entire suitcase of cloth diapers to take with us. My husband thinks I’m ridiculous (he’s right!). Yay! to the Mamas who took the plunge! The site that helped me at first was diaperpin.com, which is a forum and review site about any product related to CDs. Then I found a few WAHM sites that offered free shipping (we just don’t have CD stores near where I live…) and got my stash! On occasion, we do use s’posies, but always use Seventh Generation because any other just gives my DDs a rash. Now I teach a Cloth Diaper (and Babywearing) class because people around here need the info and are afraid to try them! SOME TIPS FOR ORDERING CLOTH DIAPERS ONLINE: Get them from a WAHM (Work At Home Mom), and order them from out of state (if your state has state tax) because then you don’t have to pay state tax ;)…and try the sample packs – get one of each to try! We have used cloth exclusively for our two boys (with the exception of vacations where the weight of luggage was an issue), and never regretted a minute. when i was pregnant with my first 6 years ago, i knew i would cloth diaper. for me, there was no other option: I was (and still am) a dedicated tree hugger. There was no way i could buy chemical filled diapers (that are against baby’s skin almost 24 hours/day) that almost immediately head to the landfill. It was discouraging, trying to find insight from other mamas. one friend snorted at me and said there was no way i’d stick to it. the most encouraging thing to me was found during an afternoon at the library: back issues of mothering magazine. There i found loads of diaper ads — then i researched online later. Well, baby#3 is now 13 months. Our Fuzzibunz have been faithful for 3 kids (I’ve been gentle and always line dry). There was never a moment where i wanted to give in to paper – even when i had a 20 month old and newborn both in cloth and my husband got transferred to another state. (oh, and we had a moment with baby#1 – I ran out of cloth and ended up using one disposable until the cloth were dry. my daughter developed such a terrible blistering diaper rash that she never wore another paper diaper again!). I know I’m doing the best for the little bums in my house. Not to mention the world. And, oh, the money I’ve saved! Even with the amount of diapers I have, cycling them through three babies has definitely made our investment go far. My son is 6 now, but I used cloth diapers on him as a baby. I knew I wanted to use cloth before he was born, wanting the most natural and healthy choice for him. Sometimes I did get tired of the smell and washing them, but I knew I was doing what was best. I eventually started using disposables when we were away from home, and occasionally on days when I just didn’t want to deal with the cloth. I think it’s important to reduce what waste you can, even if you only use cloth half the time. It doesn’t have to be an “all or nothing” decision. Any amount of using cloth will help the environment. .-= Angela´s last blog ..Mindless Distractions =-. I love my bum genius diapers. My daughter had a skin condition that would not resolve even after multiple creams and medication. (It was diaper rash, then a yeast infection that got into her hair follicles and was mistaken for MRSA) Finally an older woman dermatologist said, “Honey when you were a baby everyone used cloth. And that was all we knew. I would switch her to cloth. I never saw so many rashes and infections until people started using disposables. There are too many chemicals in them to make them absorbent and it causes a chain reaction.” Two weeks into using cloth all her skin issues disapeared. Now my second child uses them, so we have saved thousands of dollars, and helped the environment. 5 years ago when pregnant with my first I didn’t know anyone who used cloth and the flats and pins that were used on me looked so intimidating. When my son was 8 months old I bought 6 fuzzi bunz diapers (big deal since I am in new Zealand) and haven’t looked back since. I started to sew my own when pregnant with my second, now 22 months. Now I am sewing a stash for my soon to be born third child. I love trying all the different patterns and styles and I love being able to tell others I made this and you can too, it really is easy. 1. I have two kids in diapers. One is 4 months old (no biggie on the switch there) but the other is almost 2.5. He is VERY picky on a number of fronts, and I’m concerned that I’d be wasting money to buy cloth diapers for him when he’s so close to potty training (though we’re not there yet) and in the case he refuses them. Has anyone faced this before? Or switched a child over so “late”? 2. I don’t know if we’re going to have any more children. Would investing in cloth diapers at this point be a waste? 3. Finally, for a COMPLETE novice, what recommendations do you have for my 2 year old and for a 4 month old (both boys)? .-= Erin´s last blog ..Get Your FREE Italian Ice from Rita’s! =-. @Erin, At this point, I probably wouldn’t jump into cloth with your 2 1/2 year old, unless you think he’s quite a ways off from potty training. However, it would be perfect to start with your 4 month old! You would get so much use out of them and save a lot of money as well! I would buy something easy to use, like pocket diapers. Get a good brand, like FuzziBunz or BumGenius (get a one-size diaper so that you only need to buy one set as your baby grows). They’re easy for dads and grandparents and babysitters, as well as for mom. Feels fairly similar to using disposables, and the washing just becomes a part of your weekly routine and takes very little time. By buying good quality diapers, if you don’t have another child, you can easily resell them on Craigslist if you take good care of them and make sure to use cloth diaper friendly detergent in the wash.